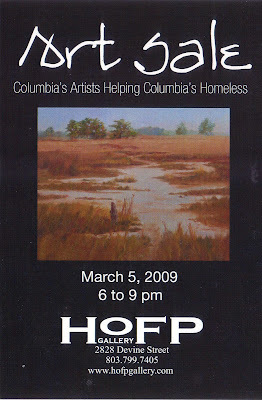 On Thursday, March 5, 2009 some of Columbia’s most talented artists are banding together to raise funds and awareness for the area’s homeless. This one-night only charity art sale will take place at House of Frames and Paintings, 2828 Devine Street from 6 to 9 PM. Several Vista Studio artist will be among the stellar line up, including: Ethel Brody, Heidi Darr-Hope, Pat Gilmartin, Susan Lenz, Michel McNinch, Laura Spong, David Yaghjian and Don Zurlo. More than 100 pieces of artwork will be available. Prices range from $150 to $1000. Items purchased can be taken immediately from the sale. The artists will receive fifty percent of the sales price. The other 50% of the proceeds will be donated to the Midlands Housing Alliance for the Homeless Transition Center project. Other participating artists include Christy Aiken, Khaldoune Khalid Bencheik, Eileen Blyth, Pam Bowers, Eddie Bryan, Nancy Butterworth, Ingrid Carson, Jeremy Carter, Anastasia Chernoff, Eleanor Craig, Robert Crainshaw, Colin Dodd, Toni Elkins, Marion Etheredge, Claire Farrell, Jim Finch, Bonnie Goldberg, Mana Hewitt, Ann Hubbard, Judy Hubbard, Howard Hunt, Roger Hutchison, Karen Jamrose, Judy Jarrett, Alicia Leeke, Barbie Mathis, Meg McLean, Regina Moody, Pat Parise, Rachel Parker, David K. Phillips, Renee Rouillier, Cindy Saad, David G. Smith, Keith Tolen, Candy Waites, Nini Ward, Barbara Welles, Charlene Wells, Mike Williams, and Ellen Yaghjian. The Art Sale is part of “Light the Way with Music and Art” and is the seventh in an Arts Series benefiting the Homeless Transition Center. It is co-sponsored by Midlands Interfaith Homelessness Action Council Art Sale, Beth Shalom Synagogue, House of Frames and Paintings, Mouse House and Morganelli’s. Artists Regina Moody, Ellen Yaghjian, and Heidi Darr- Hope are organizers of the art sale. For more information about Light the Way with Music and Art and the benefit concert series, contact Voncille Williams at 799- 2881 or email [email protected] gmail.com. For more information about the Midlands Interfaith Homelessness Action Council (MIHAC) or the Homeless Transition Center and how to help the homeless, visit MIHAC’s website at www.LightThe- WayColumbia.com.